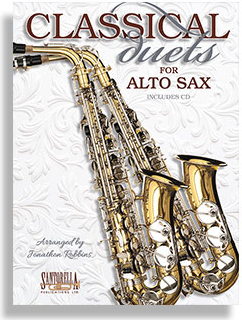 Classical Duets For Alto Sax published by Santorella Publications is edited and arranged in accommodating keys for the advanced beginner and graded to the intermediate level. Every piece is a potential sight reading exercise and highly recommended for daily practice sessions. The accompanying CD is recorded in a “music minus one” fashion by studio musicians. The student can easily isolate one track and actually play along with Mark Hollingsworth, one of the most successful reed players in Los Angeles today. Classical Duets from Santorella is also available for trumpet, clarinet, flute, trombone or violin. Mark has over fifteen years experience as a studio musician in Los Angeles recording for movies, albums, television broadcasts and numerous “jingles” as well as cartoons for Warner Brothers and Walt Disney. He has also performed in concerts with a wide range of artists including Quincy Jones, Natalie Cole, Celine Dion, Whitney Houston, Donna Summer and Manhattan Transfer to name a few. Some of Mark’s most significant accomplishments include memorable television appearances with Stevie Wonder, Ray Charles, Michael Bolton and Michael McDonald . He has worked on numerous recordings with Tom Petty, Luther Vandross, U2, the Library of Congress and soundtracks for the Ren & Stimpy show. Mark’s musical breadth also includes skills on an extensive collection of flutes from around the world. For more information about Mark Hollingsworth visit: www.windshoremusic.com.